Tut! What a fun word. In any language. Let’s say it again twice: tut tut! In Farsi, tut refers to the sweet, juicy and very popular fruit of the mulberry tree. Sun-dried Mulberries are also popular and available year round as a delicious snack that goes just marvelously with hot tea, and makes a terrific trail mix. Since leaving Iran, I have not had a single mulberry, but when we lived there, I used to climb up the trees in my family’s fruit garden in the summer and gobble up as many mulberries as I could. 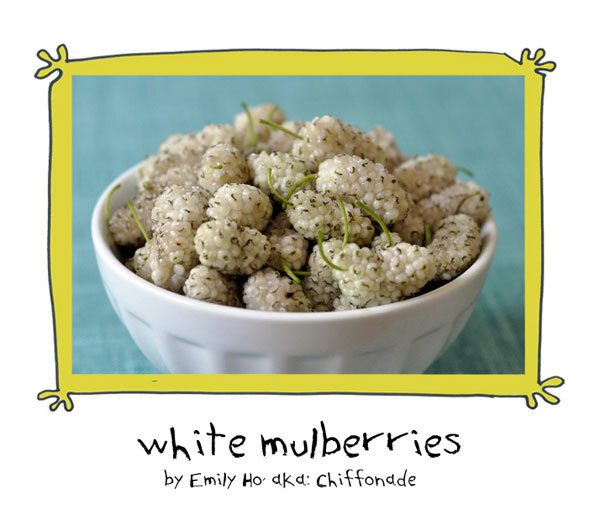 If you’ve never seen mulberries, here’s a pretty photo of it (picture courtesy of Emily Ho of Sustainable Foodworks.) Aren’t mulberries beautiful? 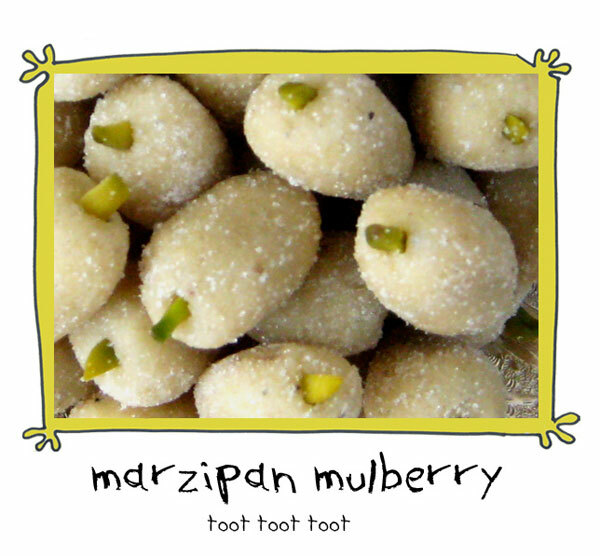 Tut also refers to a marvelous Persian marzipan confection that is made to resemble the delicious mulberry fruit. It uses dreamy ingredients like rosewater and cardamom and requires no baking: just some prep work and then some zen hands-on assemblage. 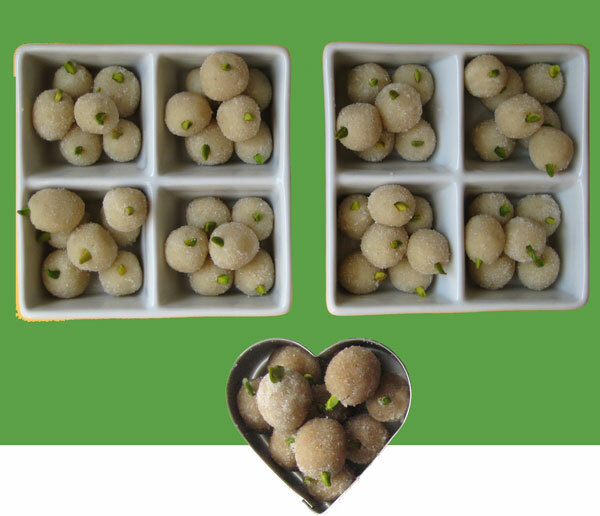 Because it is sweet, pretty and dainty, tut is among the sweets typically offered at weddings, and it is also made for the Persian New Year. In fact, the pictures you see here are from the batch that Maman and I made this past Norouz. Quick and simple recipe is a click away below – as always. And this time, we even have a video! Woot! Tut! Combine ground almonds, confectioners sugar (make sure not to use granulated sugar by mistake) and cardamom in a big bowl. 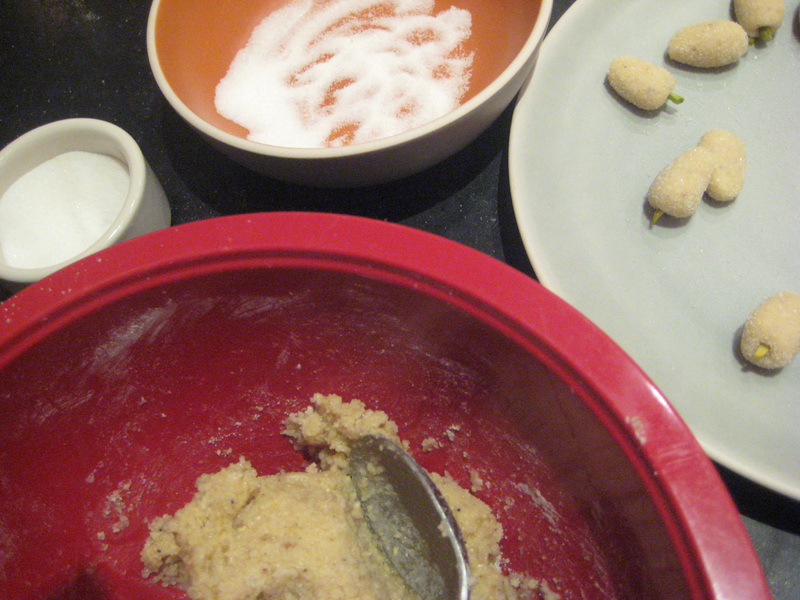 Use a fork to stir and very evenly mix the dry ingredients. Gradually blend in the rosewater – 1/2 teaspoon at a time. Stir with the fork. Then, work and knead the paste with your hands. Do so for at least a minute or two. The paste should at this point be an even, malleable, non sticky texture. (If it feels crumbly and breaks off in your hands, add just a smidgen more rosewater. But no more than 1/2 a tablespoon.) Set aside. 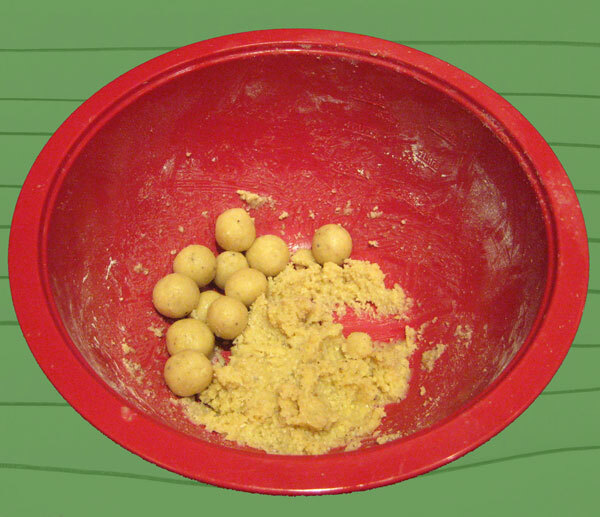 Take a small amount of paste (approximately 1/2 teaspoon) and roll between your hands to form a hazelnut-sized ball. Press down and cajole the the paste into the shape of a mulberry. The downside of toot is that it if not stored properly, it dries out rather quickly. The upside is that since they are highly addictive and delectable you won’t really have to deal with the trouble of having any left to store. But let’s say you live in a household with highly disciplined people and you have a bunch left, then what you do is that you store the lot in an airtight container either in the fridge or in a cool dry space. Don’t leave them out hanging al fresco, is what we’re trying to say here. Make it, and enjoy it, and noosh ‘eh jaan! I am so happy you are safe! Yes, New Yorkers are resilient! This looks so appetizingly delicious! It is a marvelous confection! What a wonderful gift for people too! Thank you for visiting petit! And you’re right it would make a nice gift. I think that’s what you meant, right? Yes, I was thinking of my co-workers if I attempt to prepare. Your creation looked incredible! Thank you! Thank you! Thank you! I will make this before the end of this year, and will let you know. You better! I was considering ditching the whole post (due to exhaustion) and then thought, no, I can’t do that, Norma needs it! :))) But seriously: you’re more than welcome and can’t wait till you make it and tell me what you make of it. Ooh Veronica, I hadn’t even thought of that but yeah, that would be great if you ventured into a little dried-mulberry side project. When time approaches remind me, I’ll do some sleuthing and see if I can come up with any ancient Persian hints of drying mulberry. Woot indeed! Hope the bake sale goes really really really well for Suzie! It was truly my pleasure Suzie! Seriously you’re hysterical! “Give it a pat pat pat” and you’re “super clear instructions”. SO funny and they look so good! I was thinking about these over the summer and was waiting for Norooz to make them… however I don’t think I’m going to make it that long! See how easy they are to make though? Don’t wait for Norooz! Make toot while ‘ye may! Toot-a-rama! So glad you’re safe! These do sound delectable. As always, beautifully written. Thank you so much! Toot-a-rama – love it! Thank you – yes we truly lucked out. And now we’re gearing up for another storm – yikes! Meanwhile, you have to tell me if you do end up making this – I’d love to hear what you think. Constructive crit welcome too! For real. I was on a long trip to Australia and just got back. These ‘toots’ look great. Never made them… I shall give it a try. ♥ Fae. I just remade some and want to slightly revise the recipe to so hold off till MOnday if you’re going to make some! Otherwise I encourage you to make some they’re good and a crowd-pleaser offering. Let me know how it turns out if you make some. I visited your blog a couple of weeks ago and noticed you were away on a glamorous cruise! Hope you had an excellent journey! Hi, you are more than welcome for the recipe! It is one of my favorite things and people seem to love it. You didn’t ask about this but to avoid a sticky dough, put the dough in the fridge for up to an hour after you make it and it also helps to moisten your fingers and palms as you work your way in forming the dough into mulberry shapes. Hope this works out for you! If you do get a chance, do tell me how it turned out. This is one time when I really do give a toot. My grandmother gathered all of us in her house each year. We made this pastry together. What fun. On May 27 of each year, I plan to make it in her memory. I do have 3 mulberry trees in my house. You’re welcome to come over and climb them. I hope you are skinny.